When a cursed stuffed animal is given to an unknowing victim, the spirit of Abby May, a vengeful little dead girl, lashes out blindly at the living. However, as Abby’s bloodlust leads her back to those responsible for her death, she begins to piece together the truth about how she died and how she lived. 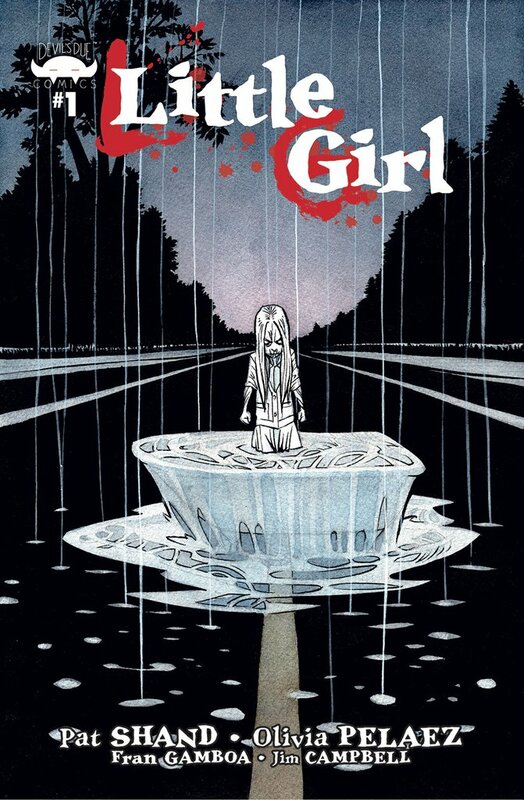 This terrifying, emotional powerhouse horror story from Marvel novelist and Destiny, NY creator Pat Shand and artist Olivia Pelaez (Modern Dread, The Kitchen Witch) challenges every ghost story you’ve ever been told. Sarah & Damen are a successful young couple, with all of the problems and dilemmas of any couple. They argue, they make up, they move on… okay, maybe the “moving on” part isn’t always the easiest, but they’re working at it. Damen is away on a business trip as he attempts to get a book picked up by a publisher. Sarah is at home, doing her level best to deal with her doubts and insecurities regarding their latest argument. When she starts to catch glimpses of movement out of the corner of her eye, to feel a weight settle on the bed with her when she knows she’s alone, all thoughts of marital problems are thrown to the curb. She’s all alone… but is she really alone? I’m not really a huge horror movie fan these days. Let me clarify… it isn’t so much “horror” itself that’s lost me as a fan, but rather the prevailing “jump scare” trend in many movies these days. As film makers try to encompass a younger audience, their resources are more limited as their movies move from the rated R domain that has traditionally belonged to horror, into the more inclusive PG-13 range. For a while, it seemed that with the exception of the “slasher flick”, horror movies had fallen into a pattern of scenes of prolonged silence broken by bursts of sudden sound and discordant music as whatever denizen of the dark lunged from behind the tree at a hapless heroine. Occasionally, a movie would come along and build up some seriously creepy atmosphere, rather than settle for the lowest common denominator. But in a market dominated by the need for every movie to flower into a franchise, that high standard often doesn’t last. Enter the importation of (and sadly the Americanization of) Japanese horror movies like The Ring and The Grudge. These movies embraced their PG-13 ratings while still managing to hang onto some really friggin creepy imagery to great effect. What does it? In my opinion, it’s the inclusion of kids as hostile spirits and vengeful ghouls. Come on, if the sight of that little girl crawling out of the television, her movements jerky and altogether unnatural, didn’t give you even a small case of the wiggins, you’re one cool customer. Pat Shand understands this, and has used the concept to outstanding results. Tapping into his own laundry list of fears, he’s created a story that starts to build from the very first page as a discarded child’s toy, a penguin, is left exposed to the elements. The toy elicits questions that are quickly shuffled to the back of the reader’s mind as the page turns and the penguin has once again found a home as part of an apology for their argument from Damen to Sarah. Shand has begun his tale by playing on the feelings of loss and abandonment of a child who’s lost a toy they loved. From there he continues to add fuel to the slowly building fire, and he does it all without the devices so important to create mood in a movie: the odd creak, thump, or groan in an empty house, the stifled intake of breath as someone who thought they were alone discovers otherwise, and possibly the most important element of all- the music. It’s the music, right? Always the music in movies in general but particularly in horror flicks that cue the audience to the mounting tension in a given scene. So what does a comicbook have to make up for the loss of audio cues? Imagery, that’s what, and if Olivia Pelaez isn’t sitting at her drawing board giggling to herself with merciless glee as she crafts her panels, I’ll eat the first stuffed toy penguin I can get my hands on. Pelaez’s style is perfectly suited to the task at hand, delivering some intensely creepy scenes through the use of framing in her panels. She shifts from tight, confined close up shots, to wide angle views cut in at odd angles. Another tool she uses to outstanding affect is in Sarah’s facial expressions as her tension and personal paranoia starts to build. In the visual department, of course, a solid nod has to go to Fran Gamboa & J.C. Ruiz for their work on colors. They use their color palette to help cement the tone begun through Shand’s scripts and Pelaez’s illustration. When a scene is supposed to feel enclosed and cramped, the team of Gamboa and Ruiz pull the shadows in around the subject of any given panel. When there’s a “reveal” on a dark and stormy night, I all but heard and felt the clap of thunder as lightning illuminated a room in stark, washed out colors. The other credit that has to be given here is one that often goes unnoticed, and that’s the work done by Jim Campbell in lettering. I’ve heard it said that the very best letterers are the ones who don’t stand out, who perform their craft unobtrusively so as not to pull the reader’s attention away from the story itself. It’s a pretty fine line, to present the text and dialogue of a story but to do it in a way that can be so easily overlooked. In crafting his share of this horror title, Campbell is the one providing those aforementioned creaks and barely audible “off camera” groans essential to every horror movie. 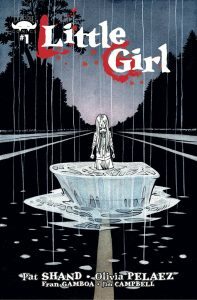 This isn’t the first horror comic I’ve seen recently, but I have to say that it stands out as one of the better examples. Where some of the more notable entries have approached their subjects from a less reserved or in some cases more campy approach, Little Girl is digging a little deeper. If your brand of horror is of the cold wet fingers flicking up your spine kind, you’ll want to give this title a read. You have no excuses, because there’s plenty of time to get this one ordered… I know, I jumped on this one as soon as I got my review copy. I got excited.